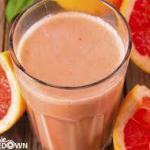 You will find the detailed information of the grapefruit smoothie recipe in the following text, we hope you will like it. Squeeze the grapefruits that you have slices into halves. Slice the apricots that you have made wait in warm water into little pieces. Put four spoons of yogurt, a half a tea spoon of coconut milk and one spoon of honey in a blender. With the help of the grapefruit juice that you pour into the blender slowly, mix the drink until it is rough. Put it in a big glass and add some ice cubes if you want to decrease its intensity and obtain a colder drink. The grapefruit smoothie recipe end in here you can also use some sugar to sweeten it in the event that it will taste bitter for you.